The power of this Heartfield image “Niemals Weider!” [Never Again!] and its universal message caused it to be reproduced in several forms. The original of this stunning piece of political art reveals the details Heartfield meticulously added to all his work. It is more than fitting that this is one of John Heartfield’s most famous pieces of political artwork. The message is universal: Bigotry cannot be tolerated, war for profit cannot continue without protest, and now we have another demand. Women cannot be treated as if they were objects to be abused. The political masterpiece was a 1931 AIZ cover, a 1932 poster, and a 1960 poster. 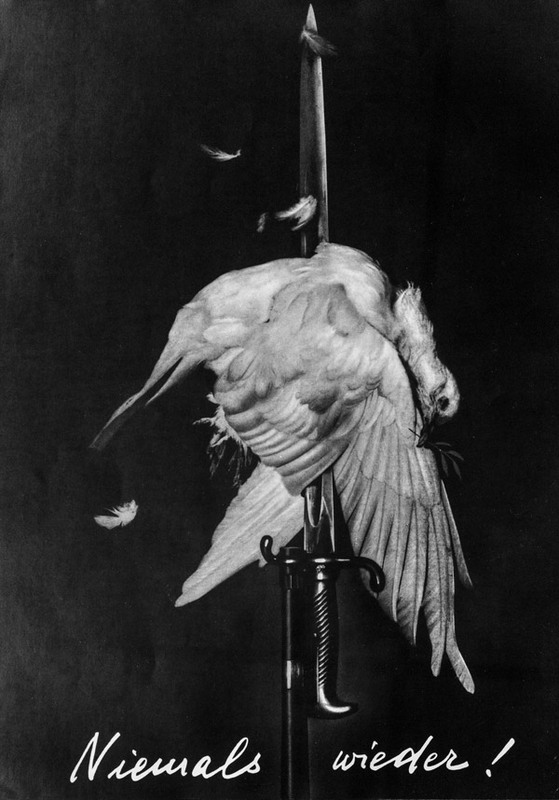 The image is a stunning visual record of John Heartfield’s hatred of war and his description of himself as “an old pacifist.” As a lover of nature and animals, the impaled dove on a bloody bayonet was an especially brutal image. The passion for this cause allowed him to envision a corpse of “the dove of peace” on a bayonet. The caption echoes the battle cry of Holocaust survivors – Never Again! The slogan of the women’s movement along with Me Too – Never Again! The constant drumbeat of war mongers and war profiteers leading to the slaughter of millions of soldiers and civilians must be allowed to sound never again!